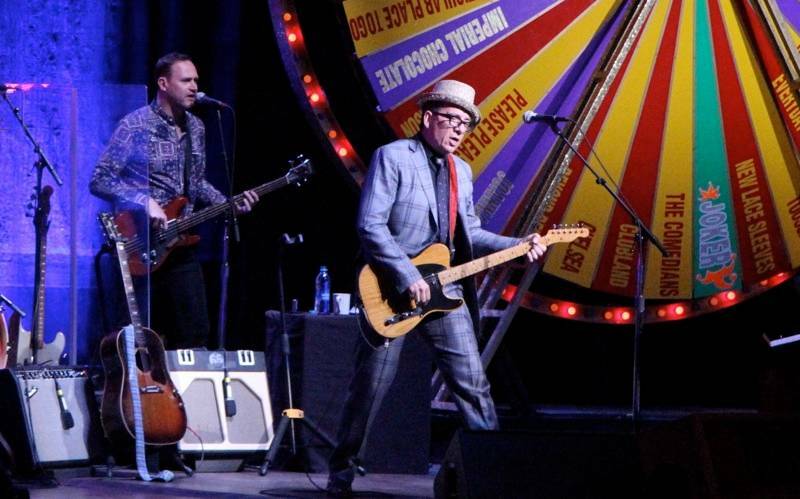 By now the prospect of an Elvis Costello show doesn’t excite this reviewer as it once did. I have to admit, I’d almost forgotten about this show – my fourth, or maybe fifth time seeing him – until it was already upon us. But damn if Costello didn’t hit this one out of the park. A few things before we get to the good stuff. 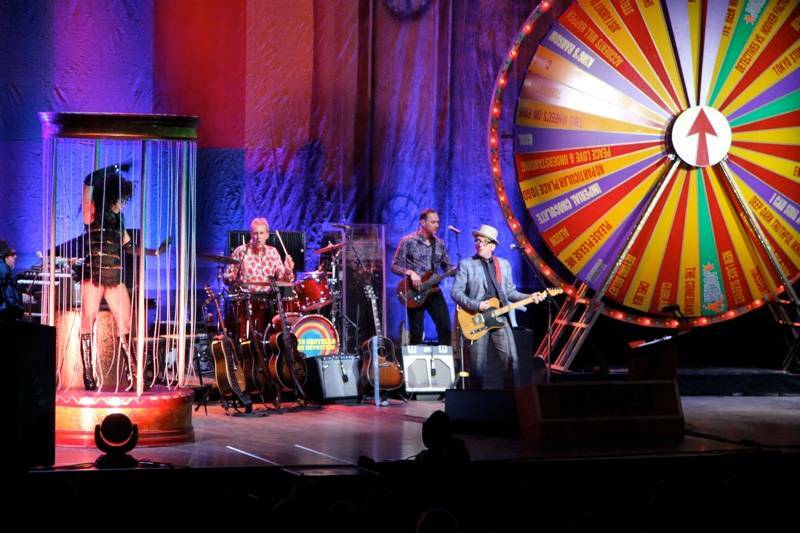 The veteran showman has chosen to resurrect an earlier concert conceit, a roulette wheel of song possibilities which he calls “the spectacular spinning wheel of songs”; he’s also installed a “hammer of songs” (a carnival game where you use a hammer to hit a block and ring a bell – according to Wiki, this game is known as a “high striker”). Two showgirls, including a Vanna White-style gameshow hostess and a go-go dancer in a cage, are also part of the show. This format has its good and bad points. 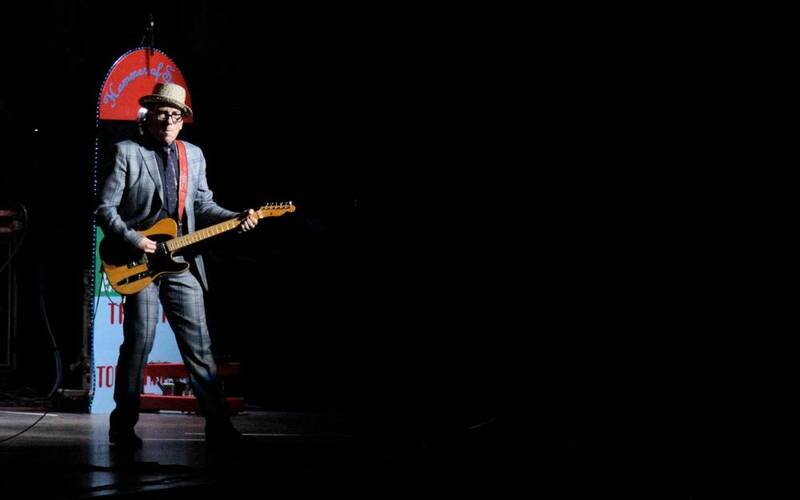 The idea of chance makes the show more spontaneous, for sure, and it’s not as though Costello and his band – Steve Nieve on keyboards and melodica and theremin, Pete Thomas on drums and Davey Faragher on bass – don’t have hundreds of songs to draw from. But the game show format also allows Costello to indulge in his self-styled Napoleon Dynamite persona and his worst showbiz tendencies – bad jokes, hammy patter – and Pat Sajak he is not. 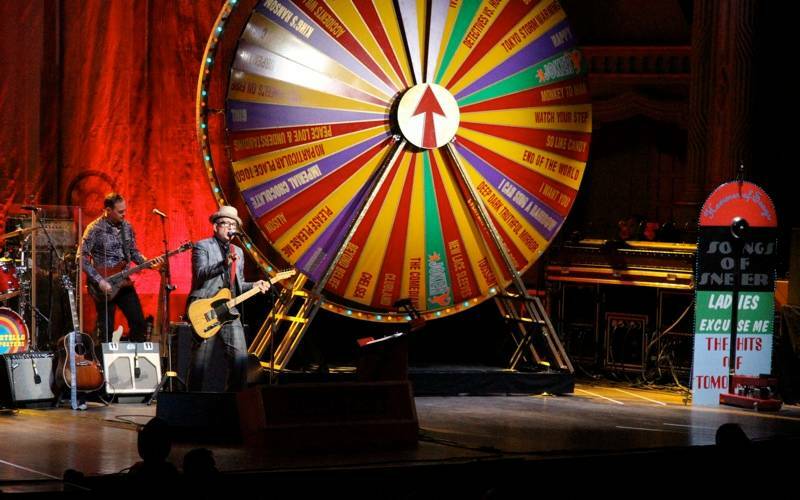 Elvis Costello at the Orpheum Theatre, April 10 2012. Robyn Hanson photo. However, we can forgive him his indulgences, especially with a two-and-a-half hour set as strong as this tour kick-off. First, Costello and band let us know from the start that they were here to rock with a four-song blast of “I Hope You’re Happy Now”, “Heart of the City” (a Nick Lowe cover! ), “Mystery Dance” (from his 1977 debut!) and “Uncomplicated” (another rocker from Blood and Chocolate). 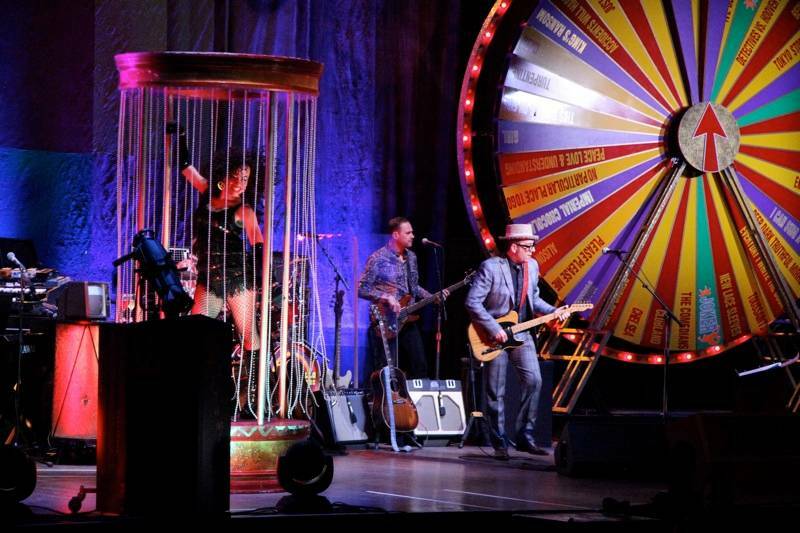 Then the fun began, as Costello and his showgirl assistants invited various audience members, usually women, onstage to spin the wheel. Most of the options listed are song titles but there are also themes; someone hit on “Time” and we heard not only “Man Out of Time” (a highlight from 1982’s Imperial Bedroom) and the Rolling Stones‘ “Out of Time” but also “Strict Time”, a song off of Costello’s 1981 Trust album I never thought I’d see live. Those were the ones that pleased this long-time fan, but there was plenty to excite the casual listener, including “Pump It Up”, “Alison”, “Radio Radio”, and “(What’s So Funny Bout) Peace Love and Understanding”. There were more cover songs, including Johnny Cash’s “Cry Cry Cry” and Chuck Berry‘s “No Particular Place to Go”, and tunes from his most recent studio album National Ransom, including “Jimmie Standing in the Rain”. At the end of the latter the singer stepped away from the microphone – a trick not unfamiliar to Costello watchers – to add some lines from “Brother Can You Spare a Dime”. Towards the end of the show, he pulled wife Diana Krall – in an Annie Hall-ish suit and tie – out of the audience. She pounded the grand piano for the finale of “Peace Love and Understanding”. Not everyone was as thrilled about the show – a reviewer for a local daily called Costello’s Presley/Motown medley “beyond meh” – but I enjoyed most of it and loved quite a bit of it. However I hope Elvis doesn’t quit his day-job to host Jeopardy any time soon. 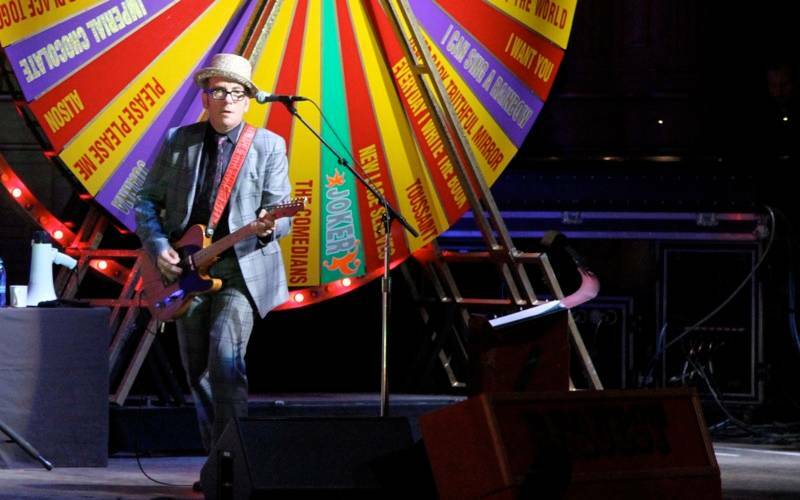 This entry was posted in concert reviews and tagged Elvis Costello, Orpheum Theatre, Vancouver concert photos, Vancouver concert reviews, Vancouver concerts. Bookmark the permalink. “you belong” on this year’s/that’s the song i most remember from the 78 show/couldn;t stop singing it walking my way home from the playhouse.